Well it’s been 7 weeks since we arrived in the land of Oz and boy have we done a lot in that time. We moved into our fully-furnished flat on 5th September and have been living here for just over a month now! 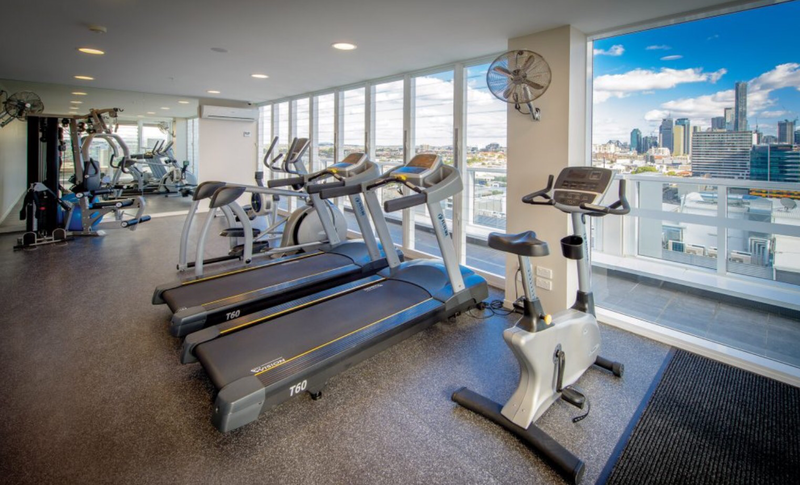 The block of flats is 15 floors (we live on floor 7) with a roof terrace, gym and swimming pool and our windows open right up to give a balcony effect and you can see the top of the Story bridge (above) in the distance. We’ve been making the most of the outdoor lifestyle that the weather affords you here, Gav and I have been using the gym and/or pool at least twice a week. 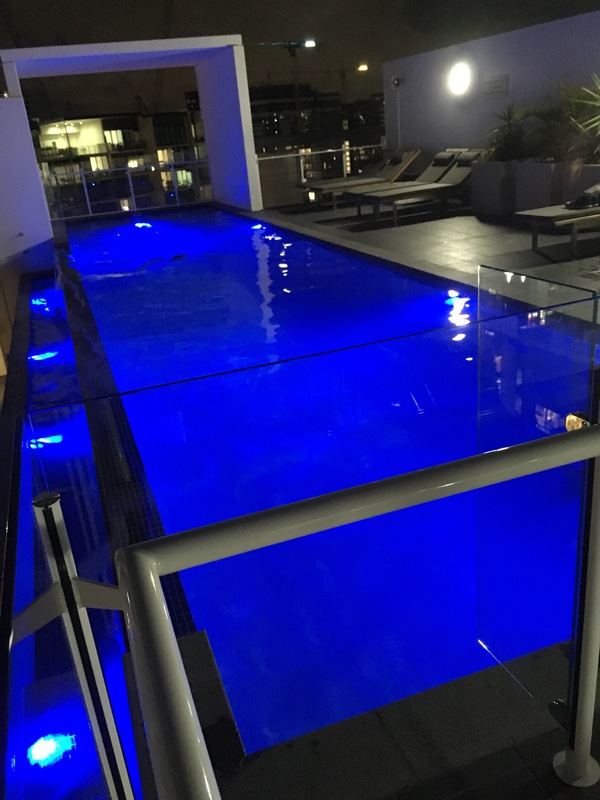 There’s nothing quite like an evening outdoor swim to relax you after a day’s work. I’ve also been attending outdoor fitness classes which was something I really wanted to do whilst over here. 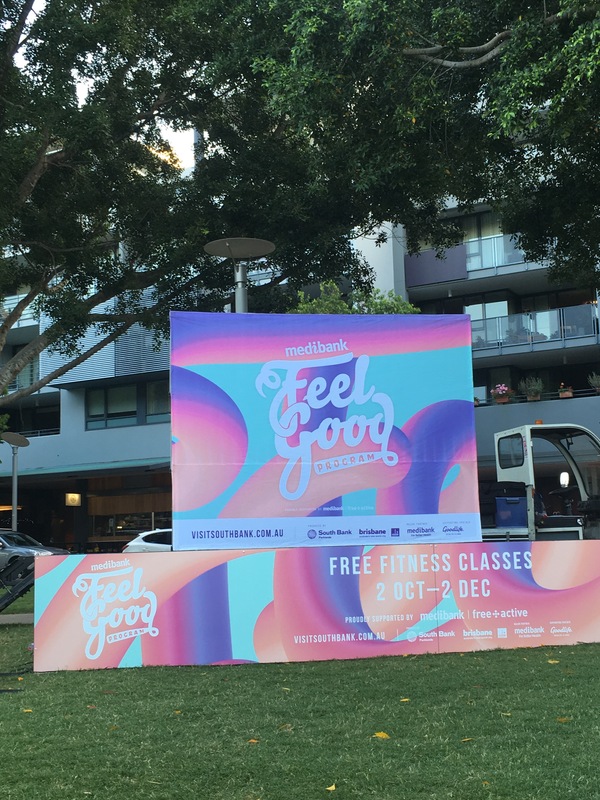 South bank, Medibank, Brisbane City Council and Goodlife Health clubs have collaborated to provide free fitness classes from October to December at the little Stanley Street lawns at South Bank. Classes range from Yoga to Bootcamp to Zumba (which I took part in last Thursday). 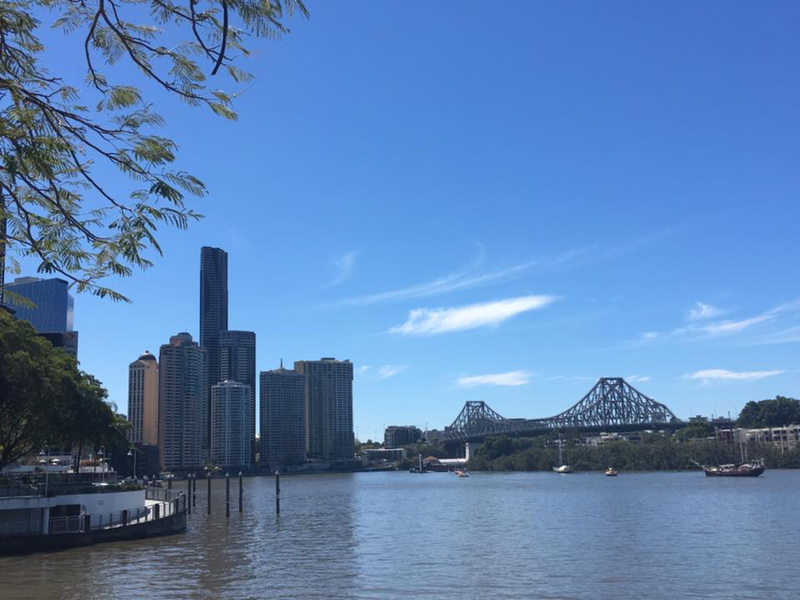 South Bank is an area in Brisbane where they have a man-made city beach called ‘Streets Beach‘ and lots of eateries and grass to chill out on on a sunny day (which is pretty much everyday)! I also attended a yoga class on Saturday morning in New Farm Park which is via the app ‘Meet-up’ which is good for introducing you to new activities and friends for free or a low cost. Having the ability to get outside is a great motivational factor in the quest to get fit! 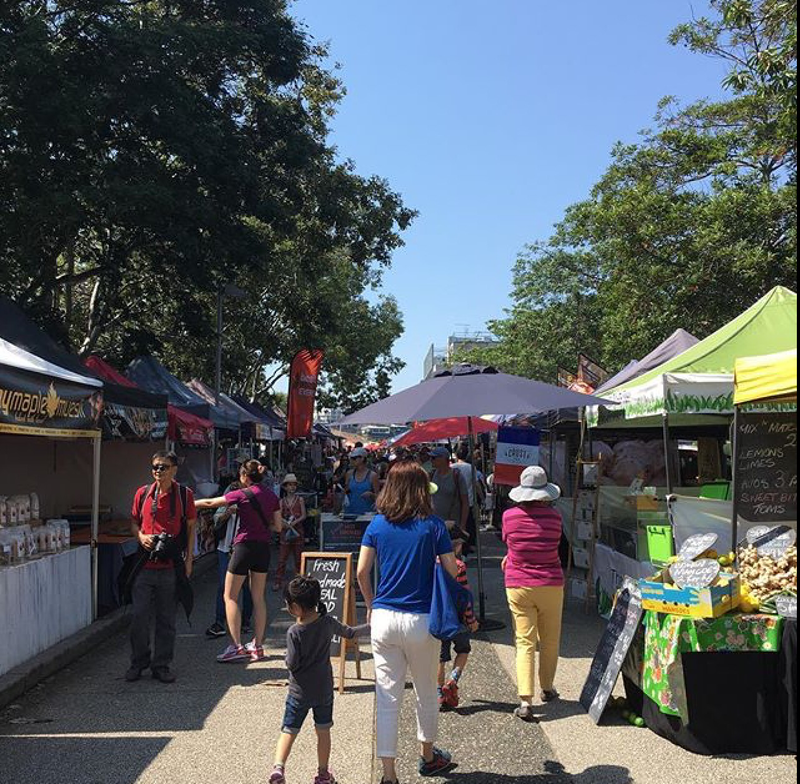 Gav and I then bought some fresh fruit, coffee and pastries at the Jan Powers market which is held every Saturday in New Farm Park. We’ve had a few fun-packed weekends since settling into Brisbane life. On our first weekend in the flat we went on a Brisbane Greeters tour, courtesy of ‘Visit Brisbane’ which is free. You have to book online at least 2 days in advance and meet outsise Brisbane City Hall. It was a really nice experience as we got to meet other visitors to Brisbane. I met a really nice French girl called Caroline and she told me about her travels in Australia and invited me to France! Veolla (not sure if I’m spelling that correctly) was our guide and she took us to Eagle Street Pier which has some great views of the city, we also visited St Stephen’s Cathedral and the small stone chapel that sits alongside the Cathedral is very enchanting and would be an intimate wedding venue. 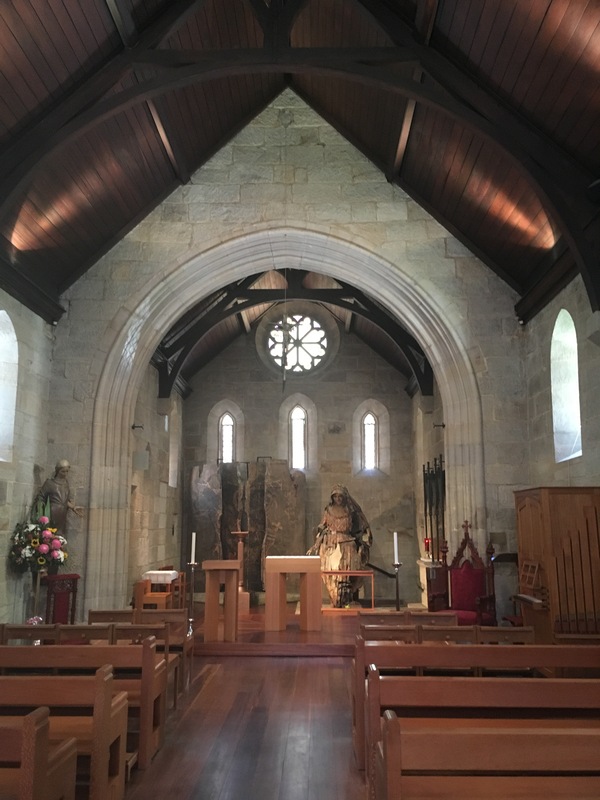 There’s a carved statue of Mary MacKillop who was an Australian nun and a saint. We also had a nice stroll through the city’s botanic gardens. 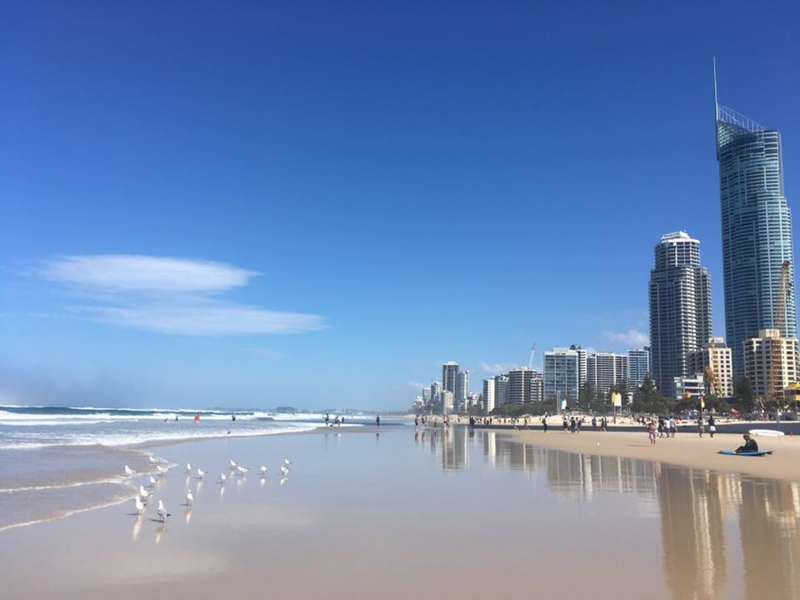 On the Sunday we went to Surfers Paradise down in the Gold Coast, south of Brisbane. We’ve made the decision at the moment not to buy a car because of our central location, so we get everywhere via public transport and we’ll hire a car as and when we need to. We took the train to the Gold Coast and there were quite a few others doing the same. The local 740 bus then meets you at Nerang station and its approx 20 mins to Surfers Paradise from there. 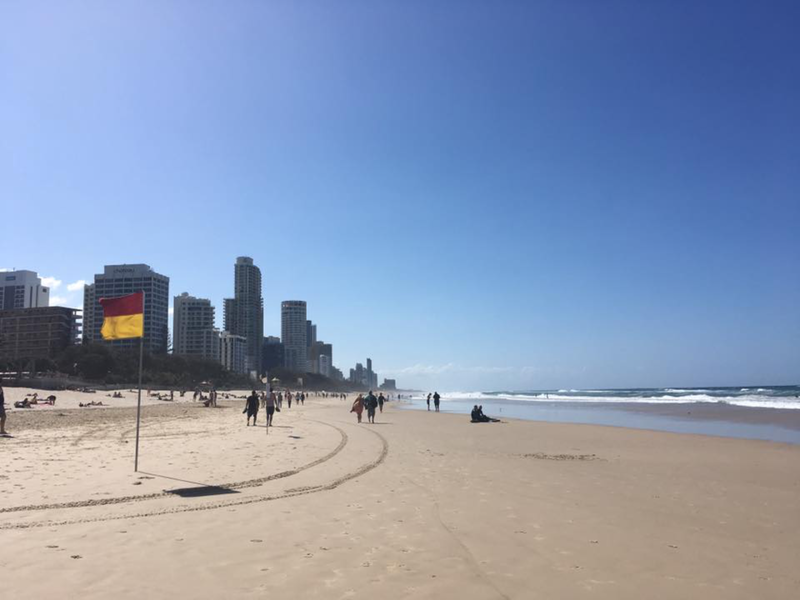 A lot of people have told us that the Sunshine Coast is better than the Gold Coast but we wanted to experience the cliché of Surfers Paradise just to say we’d been there (we’re actually heading back to the Gold Coast for Christmas to spend it with my friends who live in New Zealand). There are theme parks down there that a lot of Queenslanders recommend doing. We had a nice day just chilling on the beach with a picnic and we set off early to make sure that transport tied in. 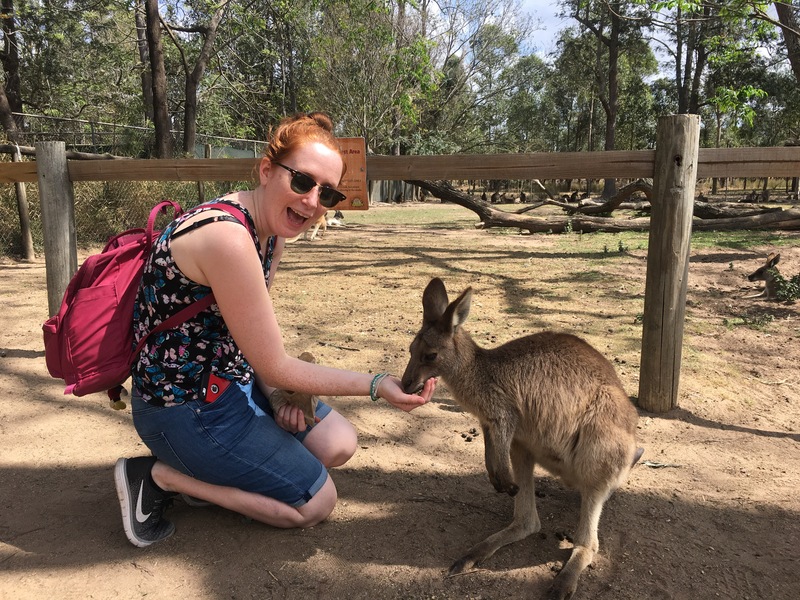 The following weekend was spent at Lone Pine Koala Sanctuary which I absolutely loved. 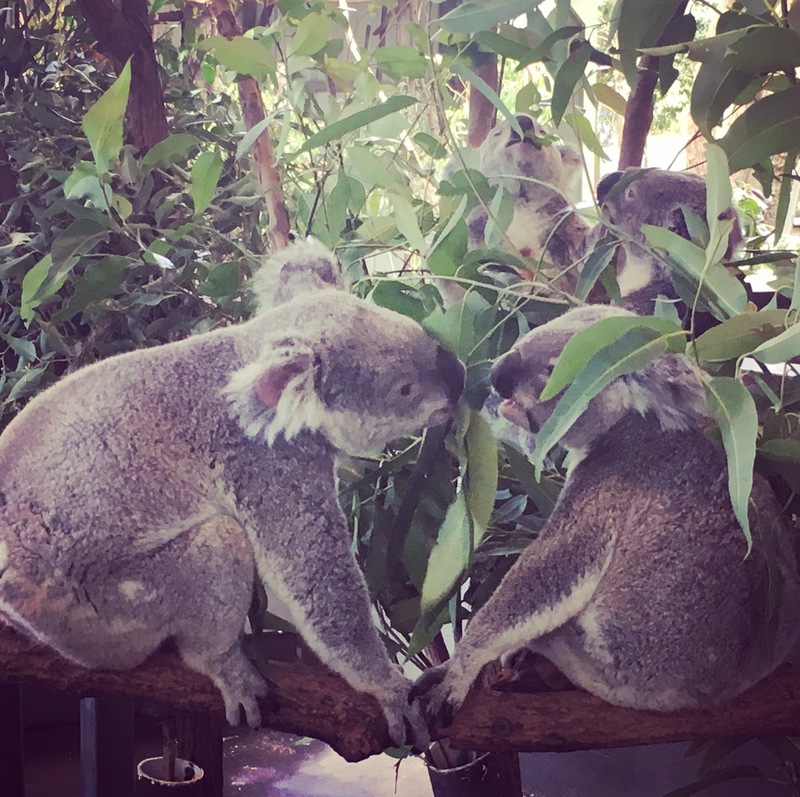 There are Koalas everywhere around the sanctuary, just chilling in their trees as well as Tasmanian devils, Dingoes, Wombats, Snakes, Platypusses, Wallabies and Kangaroos. You can buy some ‘roo’ food and feed the kangaroos and wallabies. It’s such a special experience as they come right up to you and eat right out of the palm of your hand! You can also get a photo with the koalas but if you want to hold one you have to pay $20 to do so. I got a photo with one so I got to see it up close but I then caved and realised I just had to have a cuddle with one so I did that too! It was definitely a highlight of being in Australia. The weather in Australia has been incredible. The Australians have been saying that it’s been one of the hottest spring seasons that they’ve had in a long time up to 34°c, so it feels more like summer temperatures to them. Anything above 20°c feels like summer on my pale Scottish skin! 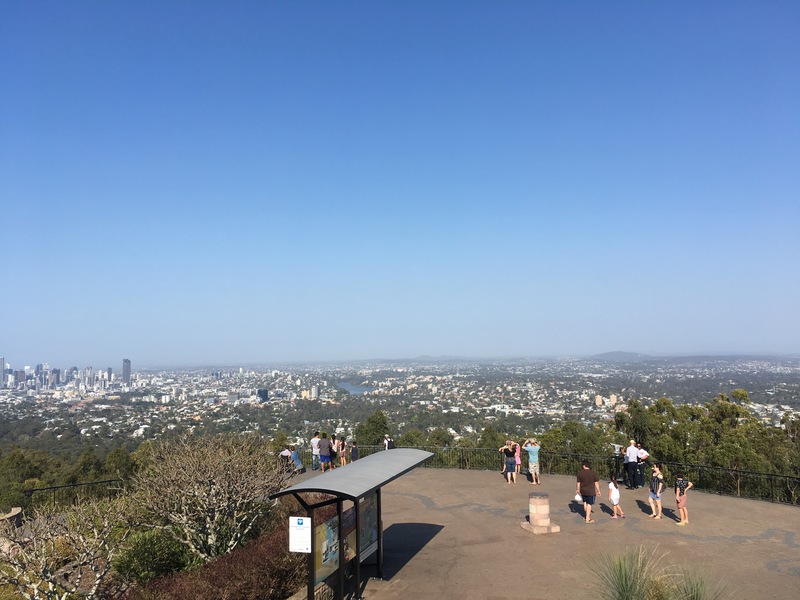 We have also spent a weekend walking up to the top of Mt Cootha which starts at the botanic gardens there and takes you up to a nice lookout point over the city. You can get a bus there that takes you right to the top or you can be dropped at the botanic gardens so you can walk up which only takes approx 40 minutes depending on how fit you are. It was particularly hot that day, you can see an abundance of wildlife on your walk including lizards, spiders hanging on their webs in the trees, bush turkeys and cockatoos. There’s a cafe and restaurant at the top which makes for a welcome reward for your efforts or you can take a picnic blanket and your own snacks to chill on a patch of grass. Sun cream and a hat are staples for me at the moment as I’m spending so much time outside. If I’m sitting for long periods of time though, I have to find shelter under the shade of a tree where possible. I’ve done a few bits and bobs of blogging since I’ve been here, check out my post on bunker and The Roastery Cafe. 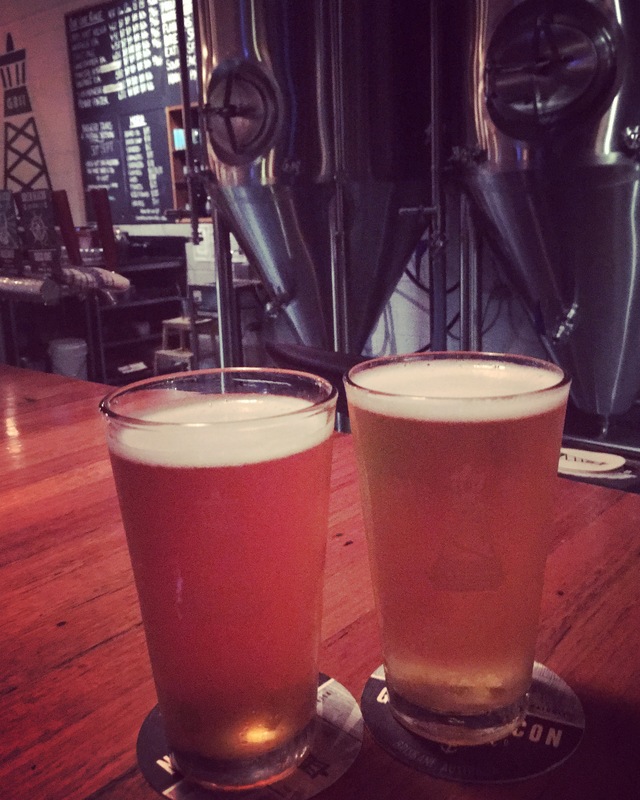 I’ve also been acquainting myself with Brisbane’s craft beer offerings which happen to be on my doorstep. Both Newstead Brewing and Green Beacon are cool places to hang out. 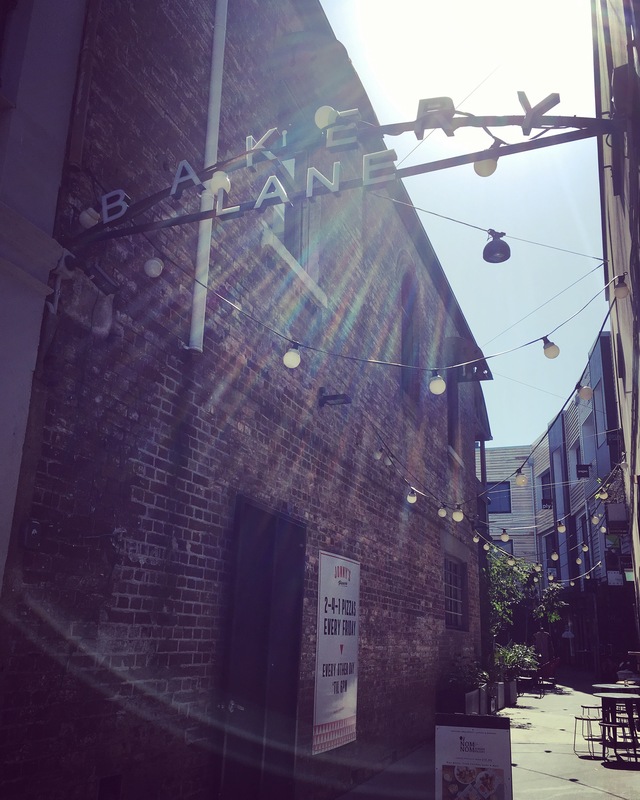 Bakery Lane just up the road from my flat and Nodo are a couple of places I like to switch off at nearby. 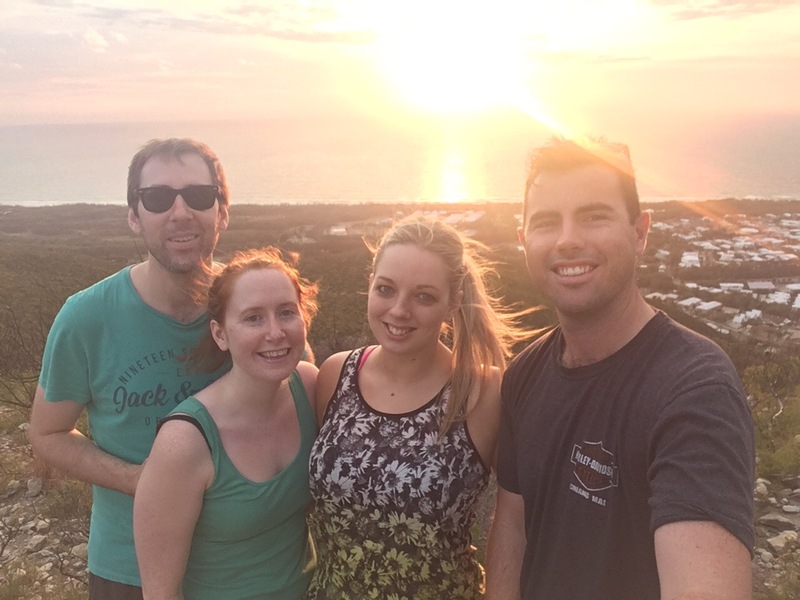 We had a truly amazing Aussie experience with Hannah and Alex whom we met on our Northern Thailand Intrepid trip. 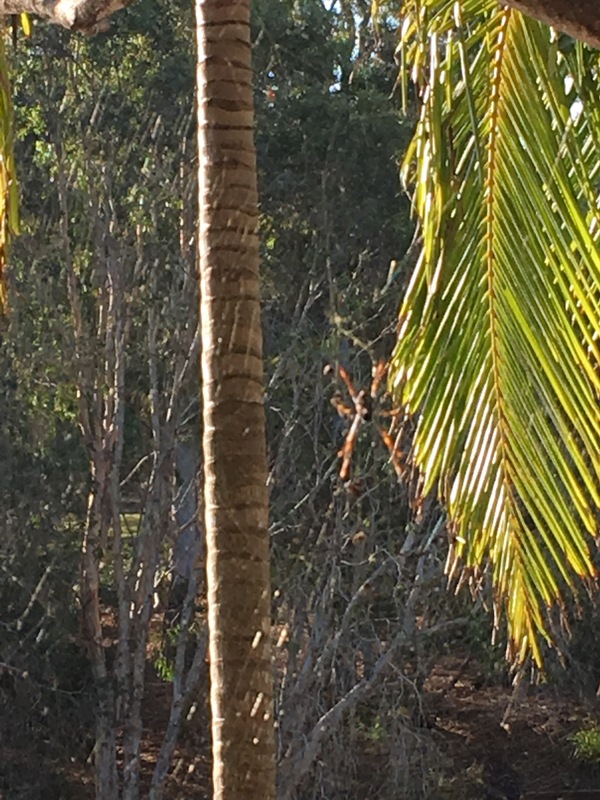 They invited us up to their home on the Sunshine Coast and treated us to some spectacular scenery and experiences. 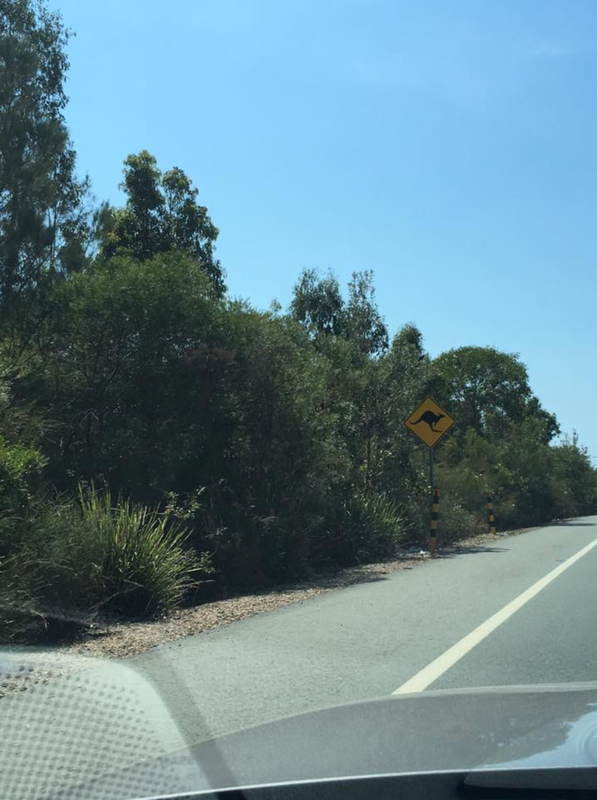 First off, they let us borrow their car on the Saturday so we could drive to Currimundi beach (pictured above) which was just beautiful. Gavin went for a run along the beach and I did a bit of reading. On the Sunday we got up at 4am yes 4am!! To walk up Mt Coolum to watch the sunrise, there were quite a few other people there with the same idea as us, only they were a lot fitter than me! 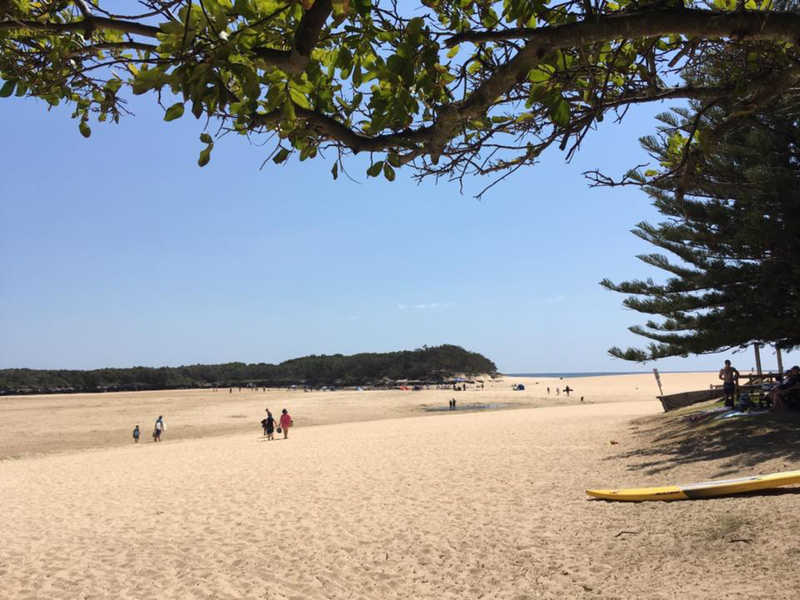 We then grabbed some coffee and breakfast before picking up a 4 Wheel Drive to take across on the barge to South Noosa North Shore to drive along the beach to Double Island Point and Rainbow Beach. Hannah did a great job navigating the tracks on the beach in the 4X4, she said that she used to go as a child and recently with her brother. 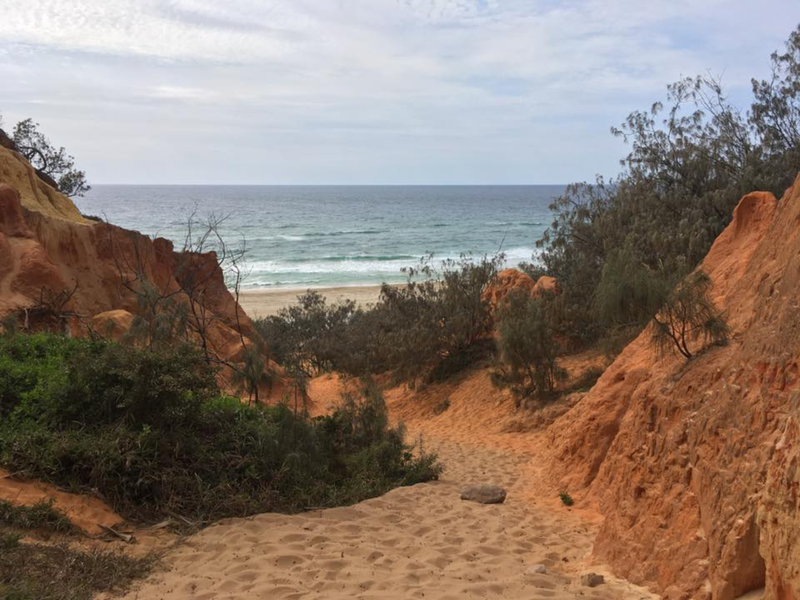 We arrived at a section of the beach called Red Canyon and we walked up to the top in our bare feet which made them look tanned as the sand looked like a rusty red colour. Once we were back in the car, Hannah warned us that we might get ‘bogged’ – stuck in the sand. 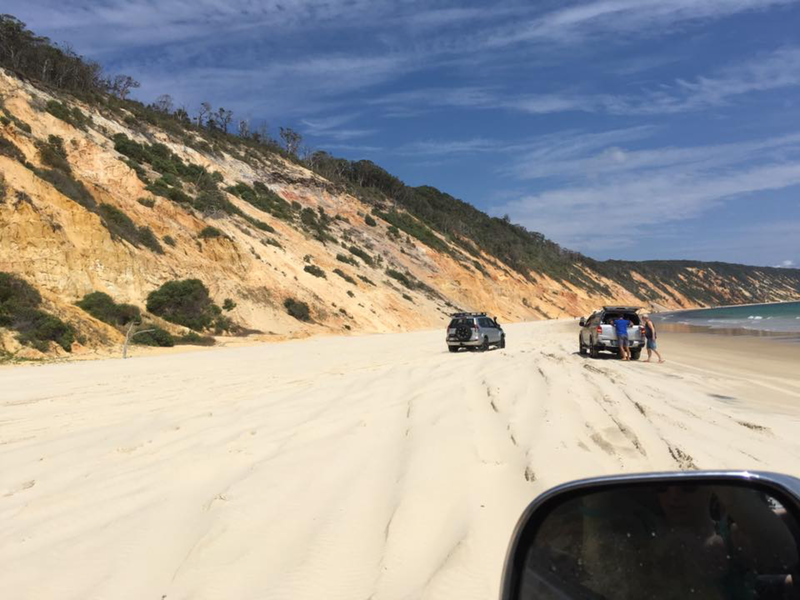 There were a lot of 4WDs attempting an incline of sand in order to get to another beach and a lot of people were getting ‘bogged.’ We went for it and ended up getting stuck as someone stopped in front of us. Then someone beside us got stuck. You can put grips under your tyres to get out but it wasn’t helping. Luckily, a man we’d helped out of his bogged situation earlier, came and helped us and we were released. The whole day was action packed and a fab new experience. We went swimming in the sea and had some drinks on a deck chair. We had a lovely lunch at Rainbow Beach in a cafe there and we saw lots of people camping along the beachside. Hannah and Alex kept an eye on the time as we had to be back before the tide began coming in and it was hairy at times when other drivers were going too slow or coming too close to our 4X4. We finished the day with a Beefy’s pie which tasted amazing! Last weekend was spent using Brisbane’s City Cycle bikes to cycle from New Farm Park to the Story Bridge. You can pay $2 for 24 hours or $5 each month to use as and when you like. 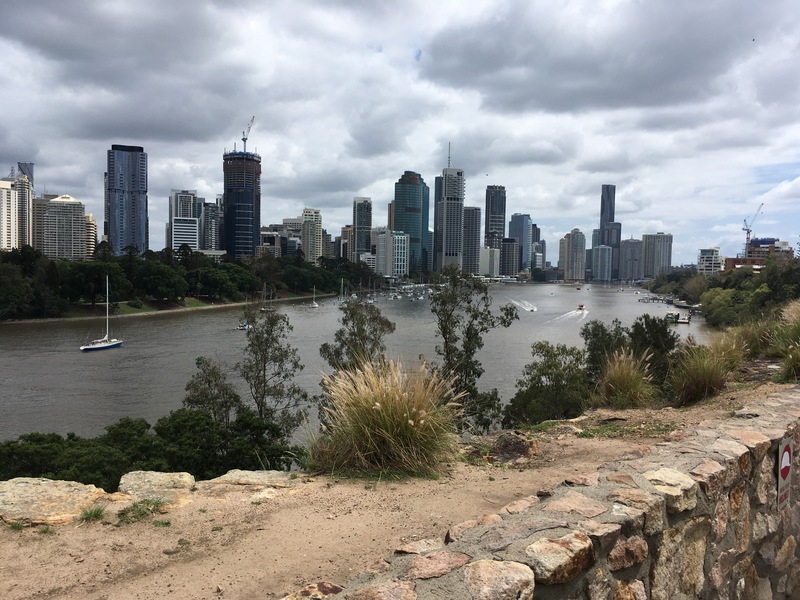 We also checked out Kangaroo Point Cliffs and ‘the stairs from hell’ which you can walk up to to get great views of the city and to reach Cliffs Cafe where we had brunch. A lot of people do fitness on the stairs and people can be seen climbing and absailing on the cliffs. Dull morning views from Kangaroo Point Cliffs but still freaking hot! On Friday we also checked out ‘Eat Street’ which can be reached via the City Cat ferry, we caught it from Teneriffe which is the closest terminal to us. We’ve also been on the free City Hopper which is the red and white boat with a Kangaroo on it that goes up and down the river. Eat Street was a real foodie haven. Apparently it’s moved recently to its current location in the Northshore, Hamilton area. There are bands playing and lots of places to sit and enjoy the foodie treats on offer. It’s partly covered so even if it rains you are all good. It’s $2.50 entry fee and most things range from about $10 to $15 each. You can get anything from Indian to Argentinian cuisine. The desserts are to die for! 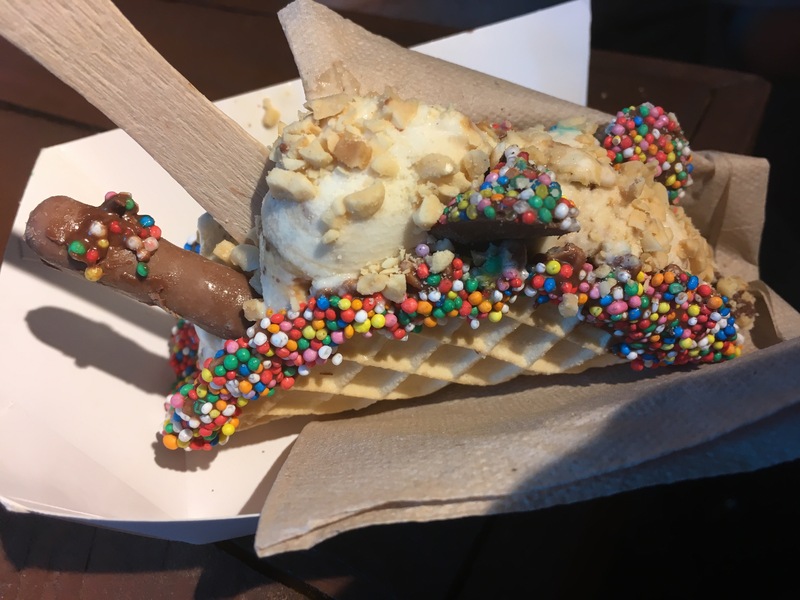 I witnessed doughnut Nutella cones and I went for an ice cream taco from Baylato, which I would recommend you do too. All in all Aussie life has been pretty good to us so far. We’ve both been lucky enough to gain work within our professions quite quickly. I have been covering a Home Ec teacher who’s been off sick and the state school just happens to be one of the best in the area. My contract is due to come to an end tomorrow so it brings with it a little uncertainty. However one thing’s for sure, this adventure we’ve found ourselves on has been anything but boring. Every week new challenges and opportunities are presenting themselves and I’m excited to do as much as possible while I’m in Australia. 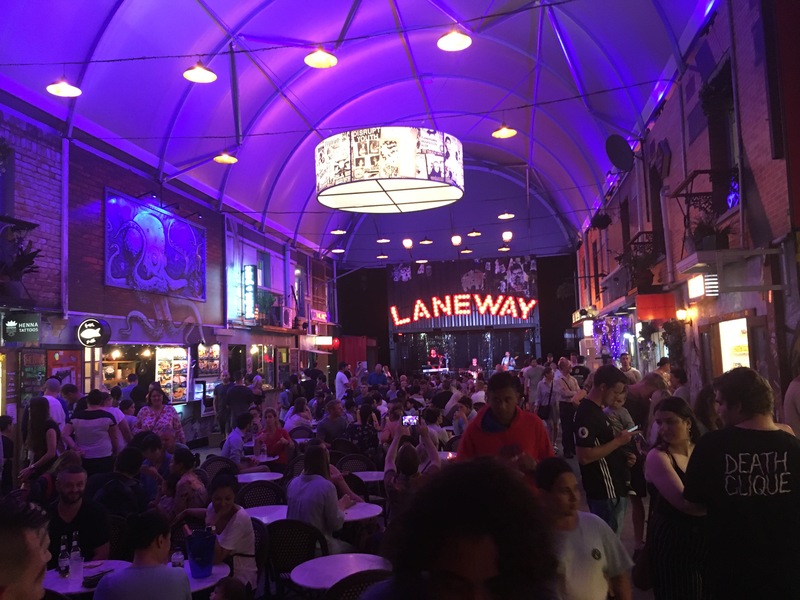 This entry was posted in 30, Alcohol, beer, breakfast, Brisbane, Coffee, Foodie, Holidays, Life, Street food, Tourism, Travel, Uncategorized and tagged Australia, Brisbane, career break, Fitness, food, Gold Coast, Koalas, Life break, Sunshine Coast, Travel. Bookmark the permalink. Oh wow, you have the most amazing apartment block ever! A gym and a pool! I’d never leave, lol! 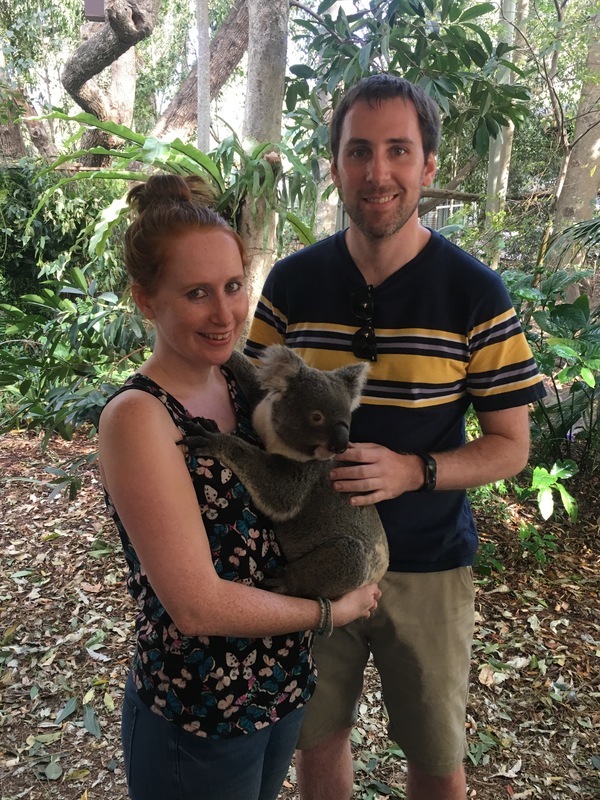 Looks like there’s so much amazing stuff to do where you live – those beaches, and how cute is that koala!! Good for you for making such a big move – a lot of people only ever dream about doing something like that. It all looks totally amazing. The sun, the beach, the pool and that ice cream taco – oh boy! It looks like you had such a lovely time. There is some nice spots on this and recommendations. I will definitely save it.